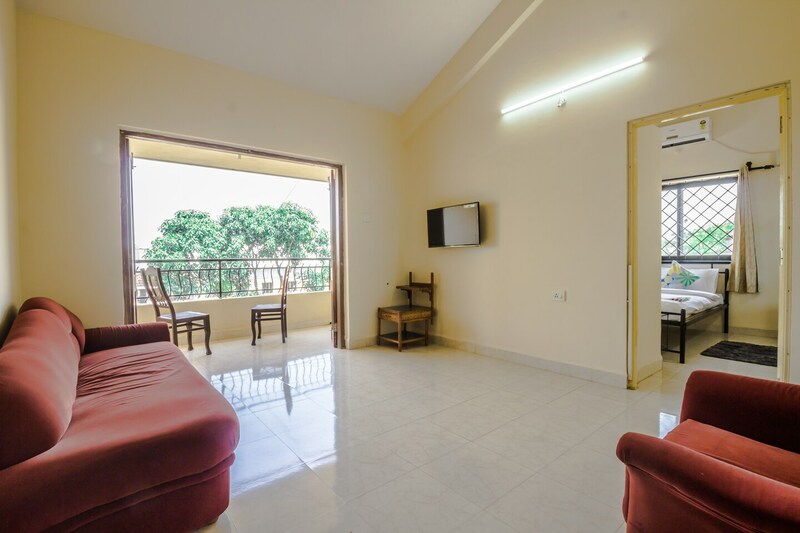 OYO 19390 Home Elegant 2BHK is a pleasant property with spacious rooms and bright, airy interiors. It is located on Corjuem Rd in Aldona, Naicavaddo, in Goa. The property is close to St. Sebastian Chapel, St, Rita's Chapel, Corjuem Fort and Sai Bhakti Mandir. The modern property boasts of spacious and well-ventilated interiors done up in light soothing tones. There are multiple balconies and windows for a refreshing feel. The living area and kitchen and neat and comfortably equipped. The bedrooms are cosy, feature stylish furniture and have big balconies. The property provides amenities like AC and TV in each room. Parking and power backup are also offered. The property is close to a number of restaurants such as Andron, 7 Short 1 Long Restaurant, Whispering Cafe And Store, Soul Curry- Multi Cuisine Restaurant & Bar.